While slowly trending down recently, Lieberman's job approval among Republicans remains in the upper 60s, while job approval among independents has fallen to the mid-to-upper 50s, as has overall approval. Lieberman's numbers are down substantially from last winter, but Lamont must still overcome very low name recognition numbers. In the June poll, 73% of Democrats said they didn't know enough about Lamont to have a favorable or unfavorable impression of him, and those that did offer an opinion split 11%-6%, not a great start with just two months until the primary (at the time the poll was conducted.) And in a three way general election, Lamont received only 33% support from Democratic voters. Lieberman got 52% (and 56% overall, to Lamont's 18%). Yet Lamont has risen to 40% support among likely primary voters, despite his low name recognition. Among the larger group of registered Democrats, he trails 32-57. Among self-identified liberal Democrats he narrows this to a 41-49 deficit, almost doubling his 22% support among liberal Dems in May. But even in Connecticut moderate Democrats outnumber liberal Democrats by about 2-1. Among moderate Dems, Lieberman leads 61-26, down from 67-18 in May, but still a very strong lead. 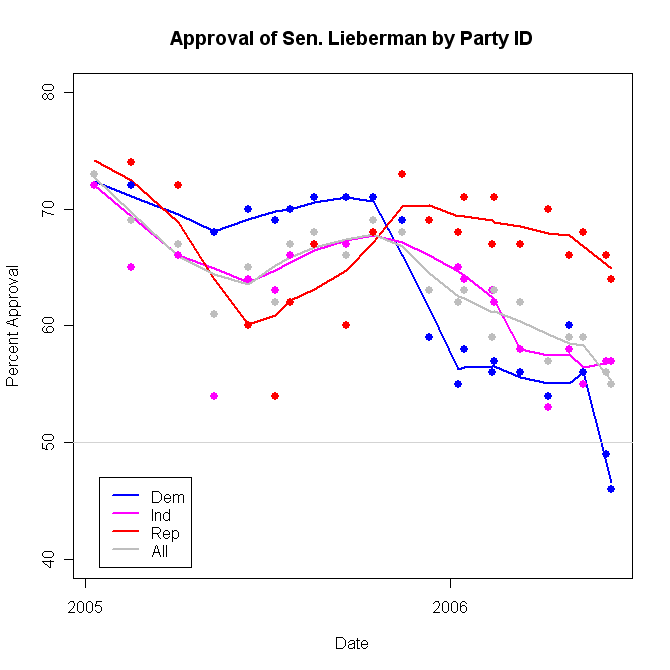 Still, Lieberman has suffered more losses in job approval and especially favorability than he has (as of early June) in vote support or reelection percentage. The figure below shows these trends through the first six months of 2006. While Lieberman might well take heart on the "reelect" and primary vote percentages, his declining job approval and especially his favorability ratings, raise the possibility of a rapid decline in personal standing with Democratic voters. (The figure above shows results among Democratic voters only.) While vote support has been a bit slow to follow, the declines in personal evaluations may be leading indicators of further vote erosion. As we enter the last month before the August 8th primary, Lieberman's embrace of an independent run for reelection may well have hurt his standing among Democrats more. (We should have some more polls next week to help answer that.) Even though he has done well in hypothetical three way races, talk of bolting the party after a primary defeat will likely further erode Lieberman's favorability rating, and perhaps bring more Dems to consider Lamont seriously. 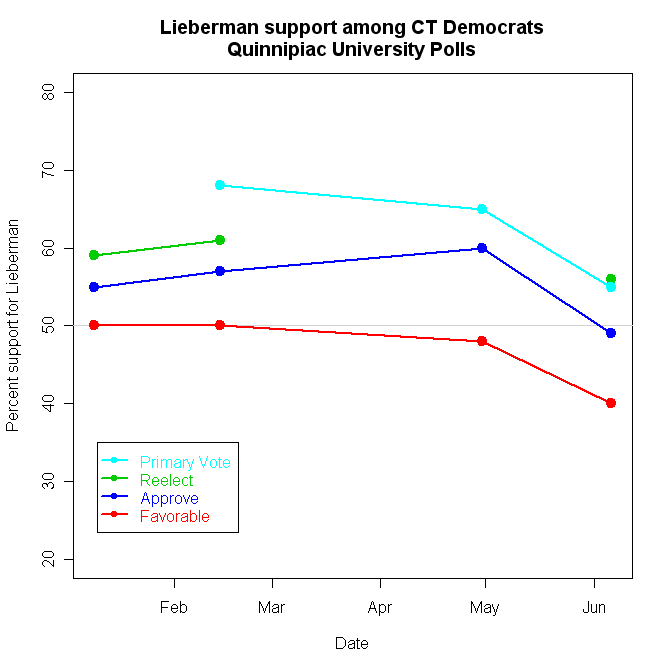 Perhaps Lieberman's embrace of the independent option reflects his private polling which possibly shows a situation grown much more dire since the last Quinnipiac poll of May 31-June 6. The SurveyUSA poll of job approval taken June 9-11 found approval at 46% compared to Quinnipiac's 49%. I'd be inclined to write that off to random noise or house effects, but perhaps Lieberman has suffered more in June than these two early June polls indicate. In any case, it is ironic that Democrats are locked in a fight over the renomination of a Senator who looked like a shoo-in six months ago. It would be ironic indeed if Democrats pick up the six Republican seats they need to take back the Senate, only to have forced one of their own out of the party. An independent Joe Lieberman might possibly decide which party controls the Senate in 2007. Wouldn't that be interesting. Bush approval passes 40%, and rising. WA Sen: Cantwell-McGavick getting closer?